How many Filipino phrases do you know, anyway? Recently, my friend posed a question on Instagram: “How do you say daybreak in Filipino?” Knowing the answer, I replied, “Easy. It’s bukang liwayway.” Wrong. There’s supposed to be a dash separating the two words, my friend said. The dash in Filipino, she said, is called gitling. This was an interesting to learn. As it happens, August in the Philippines is Buwan ng Wika or the National Language Month.The exchange with my friend and my ‘daybreak’ translation mistake made me wonder how much I knew, or didn’t know, about my mother tongue. Living in Dubai, it’s been a while since I’ve heard Filipino right outside my doorstep. You’d have to go to neighbourhoods where majority of Filipino expats live (for e.g Satwa) to hear it dominate any other language. According to positivelyfilipino.com, 679,819 Filipinos live in the UAE of which 450,000 live in Dubai, and form 21.3 per cent of the population. But on a daily basis, in a melting pot like Dubai, (of over 3 million people; 9 million in the UAE), there is probably more English spoken than Filipino. Could it be that living here and speaking English, we are inadvertently loosening our grip on our language? A recent series of videos on YouTube showed exactly this. The series, called 70 People from the Around the World, showcases cultures of various countries. The basic premise is this: seventy people (from around the world) will answer one question about their country. The question could be about their country’s geography or stereotypes, or even something like translating a word into their language. Last week, an unnamed Filipina in the video series went viral because she didn’t know the correct translation of the term cheers. The question was, how do you translate cheers? Representatives of other countries got it right. 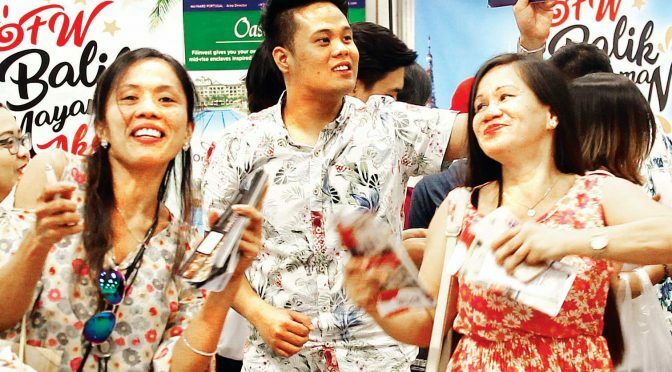 Here in Dubai, Joy Caasi, a Filipina expat blogger says the word for cheers is tagay. The video was widely shared on social media and many Filipinos were furious. Comments poured in calling out the woman. Fact check: There are several tongue twisters in the Philippines. Apart from correcting her, she was attacked and called a disgrace. Now, let’s take a step back and reassess the mass trolling. Why are we reacting like that? Many Filipinos perceive speaking in English as a mark of social status. Anyone who used to watch our native afternoon dramas can attest to the fact the affluent antagonists always spoke English while the poor protagonists spoke Filipino. And it was easy to symphatise with the protagonist because he/she spoke your language. In real life, this was especially noticeable in English-speaking Filipino expat families. History does play a part here. The 1935 constitution tasked the newly founded Philippine Commonwealth to develop a national language. Until then, the official languages were Spanish and English. It took the government two years to create the Filipino language. During that time, one can surmise that English was used by a select few. Spanish remained more accessible because the Spaniards were in the country for 333 years. Back in the country, Buwan ng Wika, the national language month is observed with poetry readings, declamations, and arts festivals. But what about those away from the country? Sure, we expats are 6,000 miles away, but there’s no stopping us from promoting it. Let’s teach children it’s not the tongue of the poor it’s sometimes made out to be. Let’s listen to OPM or original Pinoy music. And while we’re at it, teach the li’l ones one of our many tongue twisters for e.g: minikaniko ni Monico ang minica ni Monica (Monico fixed Monica’s mini cab — repeat it fast twice). You’ll never know, they might find themselves in a video in the future. >>Excuse me, which way to the Burj Khalifa? Mawalang-galang na po, pero saan ang daan patungo sa Burj Khalifa? >>Do you have change for Dh50? May sukli po ba kayo para sa limampung dirham? >>He’s wearing a purple shirt. Nakasuot siya ng kamisa na kulay lila. >>My mother likes listening to vintage records. Ang aking ina ay mahilig makinig sa antigong plaka. >>You should see Manila’s sunset at least once. Dapat mong makita ang dapithapon sa Maynila kahit isang beses lang. >>The green jar is from Thailand. Ang berdeng tapayan ay galing sa Thailand.